Atlantis Theatrical is staging Bill Condon (book) and Henry Krieger’s (music) Side Show, the Broadway musical based on the real-life story of conjoined twins Daisy and Violet Hilton. They try to make a mark in the world by being circus performers and end up finding the meaning of life, love, and companionship along the way. 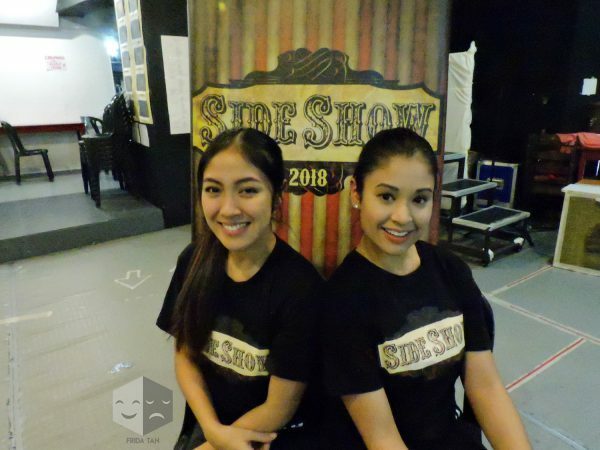 We sat down with Gab Pangilinan and Kayla Rivera who play Daisy and Violet respectively to know what it takes to play such unique roles on stage. What do playing these roles mean to you? 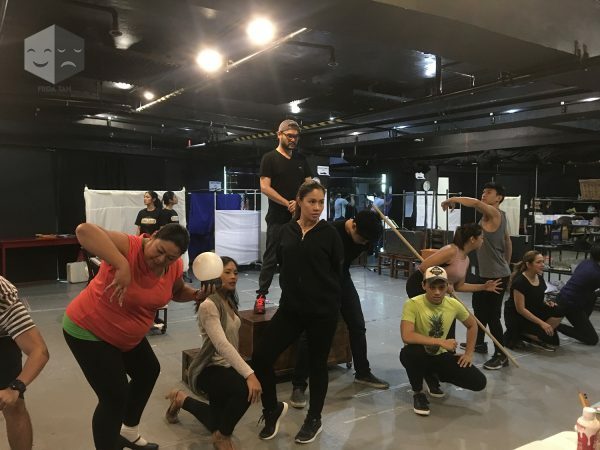 Gab Pangilinan: I actually did Side Show at a workshop for Trumpets when I was 12 under [director] Chari [Arespacochaga]. The leads then were Caisa Borromeo and Kyla Rivera. I’d be singing the songs with my sister and we’d sing the duets of Daisy and Violet. [This opportunity is] quite big. It’s quite scary and exciting at the same time because one, it’s my first lead. But it’s not just that. It’s also the most challenging because we’re [Gab and Kayla] on stage 90% of the show. We’re part of majority of the scenes, so it’s a challenge. We check on each other everyday. I wouldn’t know what to do if I got sick. It’s a big deal. It’s really exciting. the cast of Side Show sings Who Will Love Me as I Am? I just wanted to be a part of it because of the whole sentimental–I’m sentimental like that. And initially, I was called back for an ensemble role which I was so happy about. And then director Steven [Conde] messaged me saying, “Can you study Daisy’s part?” Well, we ended up singing everything, Daisy and Violet’s part. I did my best so I’m really glad, and I’m glad that I’m partnered with Kayla pa. When I interned with Atlantis before in 2012, it happened to be the “In the Heights” rerun and I watched Kayla there. So I was telling her it’s weird that we’re now partners. I just used to watch her when we were both really young. It’s really exciting because we sing, we dance, we act. We do everything that you need to see in a musical but we have to do together because we’re stuck together. So it’s really exciting and scary at the same time. Kayla: I never thought that I would be coming back to performing. I didn’t know that when I left in 2014 [for Canada] that I would ever do a musical again. 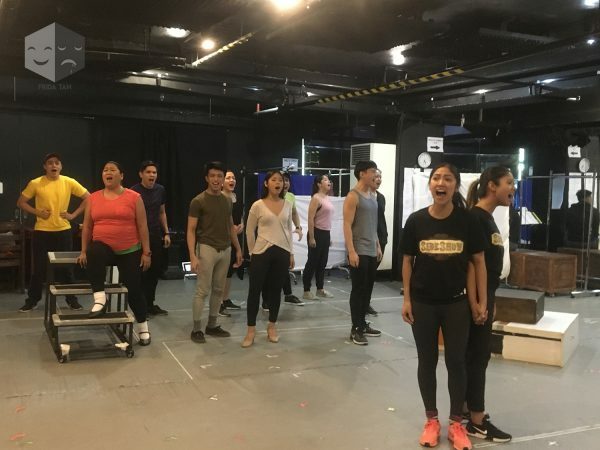 But it was just so unexpected, literally the day before I got the message from direk Bobby [Garcia] and direk Steven, I was telling a friend back home that I miss performing so much. I miss the stage. And then I woke up to a message the next day from both sila direk na, “Kayla, can you learn this song and send us a video of you singing it?” It was so unexpected. Out of the blue. But I’m so thankful that even though I was gone for those four years, that I was still remembered and that I was considered for this role. And like Gab said, I’m so thankful that it’s also her. I can’t imagine it being anyone else. I mean just coming back and performing after so long, that was a challenge for me. Like, “Do I still have it? Can I still do this? I don’t know!” But to be able to do it with someone that makes it so easy to come back into it, so easy to work with. Just such a joy. Can you tell us more about your relationship behind the scenes? Gab: We found so many similarities. Like we clicked right away. That’s why it makes it so much more fun. Like I was trying to think, if I was partnered with anybody else who’s not like her, who’s so easy to work with, with real teamwork, maybe we’d end up fighting. You know, like we wouldn’t like each other because just imagine, it’s two people conjoined. They’re bound to hate each other. So super swerte, she’s like the nicest person you could ever meet. Gab: Which is funny because that’s how Violet and Daisy are. Does your relationship help with your chemistry on stage? Gab: I think it was also because we were both so set on just doing a good job. Kayla: And we’re also surrounded by such an amazing cast. Kayla: Yeah, really. Everyone’s really just allowing themselves to be vulnerable. Like some of the roles that our leading men have done in the past were more serious. This is really pushing them to be more expressive. Gab: And everyone’s just working together. And direk Steven is just grabe, ang galing niya. He’s so focused on us and kami rin we’re so focused on doing a good job. Everyone’s just on the same boat and on the same wavelength so it’s more exciting for us. Can you tell us more about your choreography playing the twins? Gab: We just really have to work together. Kayla: We legitimately do. There was a time where we weren’t taking the right steps, I really ricocheted off of her. That was so funny. If we take a turn without expecting it, literally one would fly. Gab: Yeah, we’ll just bump into each other. So we really have to keep working on our mobility, choreography, and even traveling from the stage, the stairs, the exits and entrances, because we just have to do everything together. And because most of our scenes are together, we have to do quick changes together. Most of our costume changes are quick changes. Gab: It’s a fast-paced show. And it’s also mostly sung-through. Kayla: I think out of 24 songs we’re in 22 of them. What do you think can audiences take away from the show? Kayla: Since it’s based on the true story of the Hilton sisters, it’s such a rollercoaster of emotions. They really went through so much in their lifetime. But in the end, the whole message really is the importance of those tight bonds in your life and really just treasuring those. Gab: Because at the end of the day, it’s really all you have. Like money aside, fame aside, popularity, it’s really your loved ones, the people that you have by your side who matter. That’s really what Side Show is about I think. Apart from them being conjoined and the freaks being unique and embracing yourself and who you are, it’s really the people who stand by you despite of and in spite of your flaws and imperfections. You can watch excerpts from their rehearsals below! Gab Pangilinan has recently appeared in Rak of Aegis, 3 Stars and a Sun, and Chitty Chitty Bang Bang. Kayla Rivera has played lead roles in Atlantis Theatrical’s past musicals including In The Heights, Aladdin, Carrie, and The Addams Family. Side Show is directed by Steven Conde, with choreography by Cecile Martinez, set design by Lawyn Cruz, lighting design by Jonjon Villareal, sound design by Jason Crystal, projection design by GA Fallarme, costume design by Odelon Simpao, hair and make up design by Johann dela Fuente, musical direction by Farley Asuncion and vocal direction by Manman Angsico.